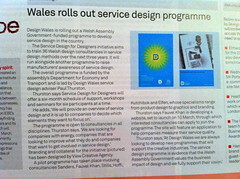 Its in Design Week, so I guess that makes it official: for the last few months we've been enrolled on the Design Wales service design programme. Its been a great experience lead by Design Wales' Paul Thurston, who has spent a time at our studio talking and running some quick workshop activities about the principles of service design, and how to apply the design knowledge we have to services. For us its an opportunity to reflect and develop on the existing services we provide in the areas that convey brand, by providing a more rounded service to our clients in order for them to give a true brand experience to their customers.